Creating leadership & mentorship development through wellness and self inquiry. Create Karma is a Lancaster-based non-profit organization I had been following since its inception in 2015. The organization combines yoga and wellness trainings with personal and professional development in leadership, mentorship and more. I enrolled in the 200hour program in 2017, and completed the 300hour program a year later. Throughout the training, a focus on self-inquiry, honest and authentic communication and holistic wellness is made - create healthy and necessary habits for an always-on world. The 300hour program requires participants to develop a community project to either train community members in an area related to yoga and wellness, or gives back in some capacity. I chose to hold a series of Design Thinking workshops and conduct local research to determine Create Karma’s reach, reception and impact. What resulted was a 60+ page document, outlining what I had learned during the workshops, and from surveys distributed to past and present participants, as well as a generalized survey that went out into the community to determine the need for leadership development and wellness practices in the workplace. In 2017, I was trained by IBM in their Design Facilitation Training through a partnership with AIGA. 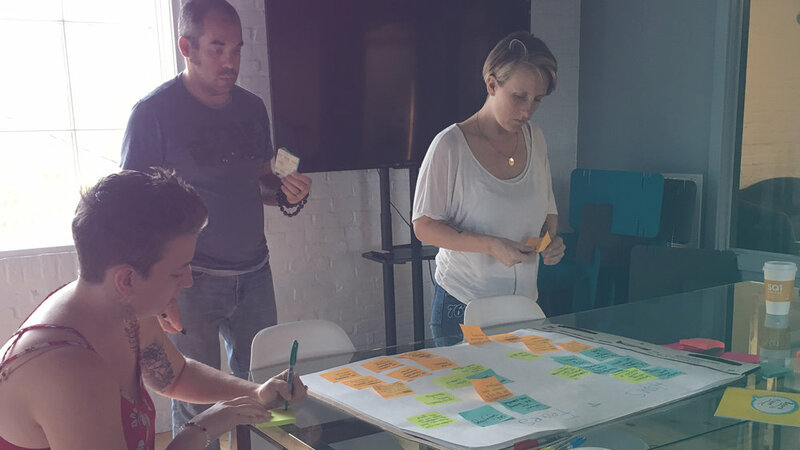 I spent a few days in one of their New York City offices learning the ins and outs of how they do design thinking with their clients, employees and communities. I led three workshops with Create Karma, each one taking on a different outlook of the program. One workshop focused on the future of the organization, another took a critical look at curriculum and its impact on the community, and the third dreamed up future community involvement opportunities. We began each workshop with a minute of silent meditation to let go of anything that didn’t need to be in the room for the sessions, and ended each with an open dialogue around the experience, hopes and fears and more.